This is a guest post by Louma from Amor Maternal. It was originally posted on her blog and has been republished here at her request/with her permission. Nine days ago, on May 31st, a Morrocan mother known as Habiba had her child taken away from her without her consent, allegedly because she breastfed her child on demand. Due to her dire financial situation, Habiba had been living with her 15 month old daughter in a women's shelter in Madrid (Instituto Madrileño del Menor y la Familia- IMMF-, which roughly translates to Madrid's Family and Children's Institute). In later declarations and radio interviews, Nacho de la Mata, her lawyer, informed the media that Habiba had left her child at the facility's daycare center as usual, and that the child was taken away immediately from there. She was then notified that she could no longer live at the shelter, for this facility only took on the care of mothers and she no longer had a child. Fundación Raíces, a humanitarian organization, immediately took on Habiba's care, providing psychiatric evaluations, performed by well know birth rights activist and author Dr. Ibone Olza, along with legal services, healthcare and financial aid. According to anonymous information released in the press, supposedly coming from the IMMF, Habiba's child was taken away from her due to her failure to comply to the center's "Psychotherapy and Maternal Habilities Program", allegedly because she was "a violent person", although there are no records of this alleged violence. "I'm under the impression that [Habiba] is a sensible and loving mother, with a healthy attachment to her child." "It is obvious that this separation is highly stressful for the nursling and I can easily predict oncoming symptoms of psychic distress if the physical and emotional bond with her mother is not immediately restored"
"Based on Habiba's thorough psychiatric evaluation I have reached the conclusion that this woman does not suffer from psychiatric disorders nor does she have a drug habit. In my opinion, she is a very capable, loving woman who is now suffering enormously from having been abruptly separated from her child." "As a child psychiatrist, I know that suddenly separating a fifteen month old child from her mother, transfering her to a government facility with no one the child is familiar with present, causes great damage that could have enduring psychological consequences, if not reunited as soon as possible." Habiba is not only suffering emotionally but also physically. The day Dr. Olza took on her care, she was suffering from engorgement and was on the edge of developing mastitis. Dr. Olza helped Habiba express her milk and took a half liter of breastmilk to the IMMF. After a lot of persuasion, and arguments about how it would be a crime to waste this mothers "liquid gold", the IMMF accepted the milk although that poses no guarantee upon the child ever being fed it, as Breastfeeding is strictly forbidden in all child welfare group homes. This news appears to contradict the strong support of breastfeeding in Madrid's breastfeeding and parent-child bonding programs for health professionals. Thus the IMMF's attitude on breastfeeding, and their opinion on it, calling it "chaotic and damaging to children" has caused great alarm among mothers everywhere, not only the breastfeeding community. According to declarations in the newspaper, allegedly coming on behalf of the IMMF, the reason for separating mother and child has nothing to do with their breastfeeding relationship, yet after saying that the child was removed from her mother's care "temporarily and the case would be reevaluated", they warned Habiba beforehand that nursing her child during their one hour weekly visit was absolutely forbidden supposedly because "it would be contrary to the child's institutionalization". On Saturday June 4th, Dr. Olza decided to seek public support for Habiba's case, and started a Facebook Group called Que el IMMF permita que Habiba amamante a su niña YA (IMMF please allow Habiba to breastfeed her child right now). In less than 24 hours, the group grew to over 2000 members, and currently has over 3500 (and continues growing by the minute). Yesterday, Habiba was allowed to visit her child, for only an hour. After nine days of being apart, they were reunited for only sixty minutes. Since information on this case became public, other similar cases of women being forced to wean their children upon threats of their custody being taken over by the state have been brought to light. A public petition in Spanish was signed by over 3500 people, and another 5200 have sent personal letters to the IMMF and other Spanish authorities, as well as Save the Children, Amnesty International and other NGOs to express their support for Habiba and request her to be reunited with her child as soon as possible. "My little girl is no longer the child I knew, at first she wouldn't even look at me... she has lost half a kilo, she looks very thin, this is not proper childcare, she had circles under her eyes, she started crying as soon as I picked her up but then she would stop immediately as if she didn't have the physical strength to cry any longer, she didn't seem like my daughter, she looked like a dead child, a doll". "She wouldn't look her in the face, she looked at her as though she was a complete stranger, not wanting to go near her, [another possible reaction could have been] the contrary, not wanting to let go of her mother afterwards." "... it was absolutely predictable that the child wouldn't seem happy upon seeing her mother given the circumstances," which is something that an untrained observer could [but should not] interpret as "the child not loving her mother, or that [Habiba] was not a good parent". "On the contrary, the fact that she reacted this way is proof that the child has suffered enormously from this deep feeling of abandonment"
Not only has the child been traumatically separated from her mother, but there also aren't sufficient caregivers to provide children with the nurturing that they need. After visiting the shelter at which Habiba's baby is being held, Fundación Raíces told the press that during night shifts, there are only two caregivers for 42 children under the age of six. Less than one hour ago, a representative of the IMMF in charge of Habiba's case has verbally accepted that she sees " her child one hour a week in order for her to maintain their breastfeeding relationship" to which the president of Fundación Raíces has replied that he obviously has absolutely no knowledge whatsoever about breastfeeding. His response was that the IMMF would evaluate the possibility of more generous visitation rights. We ask you all to please go stand and protest in front of the IMMF building right now to request that this institutional abuse upon Habiba is put to an end immediately. The address (in Madrid) is Calle Gran Vía 14. The following is extremely important: please take the picture above printed on paper to use as masks during the protest, Habiba does not wish for her face or anyone else's to be displayed in the media. 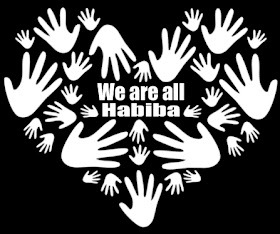 We will all wear this drawing as masks because We are all Habiba. I'm perfectly aware that this story seems very much like a hoax, but with well know professionals such as María Teresa Hernández, member of the Spanish Pediatrics Academy's Breastfeeding Commitee, award-winning lawyer Nacho de la Mata, well reknown authors and birth activists Isabel Fernández del Castillo and Ibone Olza, among others backing the information and giving their personal impressions on the matter publicly, things seem greatly believable. If this story has touched your heart, if you wish to help in any way, please share this post. If you have a blog, please re-publish this information, if you know anyone in the press, anywhere in the world who could help in any way, please do contact them. If you wish to support Habiba on Facebook, please join this group in Spanish, or this international page with other translations, including English and French. Please sign the public petition in Spanish, or in English (rough translation). I joined the international group, and I've retweeted the link to the article. I hope that this woman is allowed to have her child back...I'm shocked. As a dual Spanish citizen I AM HORRIFIED. This is UNACCEPTABLE. I am disgusted, sickened and deeply deeply sad for that child and her mother. I can't imagine the agony that both are going through. Just the thought that this could happen to any mother anywhere is a tragedy. These people (and I use that word loosely because no normal person would do this to a mom and baby) who have destroyed that childs life, should be stripped of their power and undergo serious counselling in the hope that one day they are fit for society. I really have no words. Just tears. Wow, I am horrified. My 15-month-old daughter is napping on me right now. I can't imagine suddenly being separated from her. I have signed the petition and sent a letter to the Spanish embassy in Canada... where else do I write... I feel so helpless. I wish I could be there to protest in person. This should not be happening. I never considered Spain to be so behind... they are supposed to be a developed country, their health authorities have a lot to learn. I am traumatized at the thought of the way this woman and her baby have been treated. How awful. This is one of the worst things I have ever read. I can't imagine how this woman must feel and her poor, poor child. I will share immediately, thanks for sharing Annie. The whole thing is disgusting. Until you have a child that has never left you for more than a few hours and is still nursing, it's hard to understand--but this is about as grave a human rights violation as I can imagine, particularly since it has done damage to the child for life and there is now no fixing that. This is very similar to the way the US treats immigrant families, deporting parents and leaving children behind on a regular basis. It seems that around the world, human rights are only for citizens (and maybe just those with financial resources). The IMMF says they won't give her back until the mom has a job and a place to live. Given that she has a place to live now, this requirement would basically mean 1/5 of Spain would have their children removed. The *holes are giving her 1 hour a week to breastfeed her child. I am outraged. This honestly has me in tears. Being separated from any of my children would be horrific, but being separated from my 2 year old nursling would be unimaginable. I have signed. I wish I could do more. Oh my God, oh my God, I feel as if I might throw up reading this. I have a 12-month-old nursling, and if someone took him from me, I think I would die. I am crying and letting down as I read this! What can we do, Annie? I am retweeting, but is there anything else? Can we donate money to help her? This makes me sick to my stomach. All three of my babies were nursing around that age and I can't imagine the thought of them being separated from me for nine days at that age and I live in a safe and secure home without the other issues this woman and her child are already dealing with. I can only hope that something positive comes from this story. Oh my gosh. I can't even imagine this. My son is 15 months next week and still nursing. I left him for 6 hours on Tuesday (with his grandparents) to go to a meeting and since he was asleep when I got home I didn't nurse him until later and I was already in pain. I feel for the mother extremely and for the baby.... the reaction when she saw her mother. How horrific. How sad. How devastating. There aren't even enough words to describe it. This is when I feel so completely powerless. I wish there was more that "regular" people could do. How can governments mess peoples lives up so badly??? This family has just been dealt pain at the hands of the government. And as someone else pointed out... does it have anything to do with the fact that she's a minority??? I've sent requests to my favorite news programs to ask that they look into and cover this story. It is frustrating to read something so shocking and not be able to find much of any further accessible information online. It is quite sickening to see the cultural conflict disaster here, with the Spanish apparently being deeply opposed to breastfeeding(??? I had not heard this before) and the mother's culture being strongly in favor of lengthy breastfeeding (I am assuming from the name, perhaps incorrectly, that she is muslim; the koran specifically recommends nursing to age 2). June 10, 2011 | M.T. I think the best thing to do is to follow the facebook page. They keep updating there. I know yesterday they were asking people to write to, call, or protest in front of Spain's embassies and consulates in other countries. I have to say I admire her strength in going through the proper channels to see this publicized and corrected. If someone took my 2 year old (who is still nursing) away from me in this manner... I can't say I wouldn't snap and go all she-wolf on them, and being violent, breaking into a building to find my son would only hurt the situation. Not sure if this has been brought to the attention of the authorities yet, but Spain was one of the member countries (along with all EU countries) that endorsed the WHO Global Strategy on Infant and Young Child Feeding (http://whqlibdoc.who.int/publications/2003/9241562218.pdf). Further, several Spanish representatives were involved in the writing and approval of the 2004 document "Protection, promotion and support of breastfeeding in Europe: a blueprint for action" (http://ec.europa.eu/health/ph_projects/2002/promotion/fp_promotion_2002_frep_18_en.pdf). Clearly this organization (IMMF) is unaware of their country's official stance on breastfeeding. At least the internationally visible stance. One more thought...the EU document (Protection, promotion and support of breastfeeding in Europe: a blueprint for action) also states not only that the "protection, promotion and support of breastfeeding are a public health priority", but that they "fall squarely into the domain of human rights." Has the public health officer been contacted? I am horrified that this could happen in a country like spain and im ashamed to call myself a european when grave injustices happen in our land. i hope that mother & child are reunited soon, & i hope the mother knows how many people support her and are behind her. im not a mother, but i know mothers that breastfeed there child(ren) both longer and shorter amounts of time than the ''average'' but its a personal choice, it should be for the mother to decide, and as ''breast fed is best fed'', this woman was doing the absolute right by her child, the spanish authorities have failed horribly, they want to protect the child, yet every second she is away from her mother any longer, she risks developing more serious mental AND physical problems, as well as this poor mother. my love goes out to this woman! And i hope when this ordeal is over that she sues the s%%t out of those ignorant busy body authorities! If you are in Ottawa or nearby & want to join in on a discussion for a possible nurse-in in front of the Spanish embassy in Ottawa. Gerente Instituto Madrileño del Menor y la Familia. Unacceptable. By those standards, my mom would have had all of us taken away since she nursed us all for AT LEAST a year. Heck, she nursed me until I was 2 1/2. Bad mother, huh? I'm very angry. Very, very angry. I couldn't agree more, Tara... You have to be seriously disturbed to not only separate a mother and child like this, but also to do nothing about it. Government authorities have been issuing contradictory statements since, saying things such as the reason for them taking over Alma's custody not having anything to do with Habiba's breastfeeding, then stating they were going to consider granting Habiba 1 hour weekly visits to "allow her to breastfeed Alma". Outrageous, isn't it? Hi Nadia, thank you for signing the petition. It's not a whole country that did this, it's one government authority... Dr. Olza was particularly surprised because Madrid has very good government-funded breastfeeding education programs for health practioners, and this particular case (as well as many others that have come to light since, coming from the IMMF are contradictory to those programs) and is requesting that all personnel that handles babies and toddlers receive the same training programs. Please consider joining the Worldwide Facebook Page, we're organizing simultaneous peaceful protests in many cities in front of Spanish embassies and consulates on June 15th. The link is at the end of the article. Exactly Sandi, not only should 5 million families have their children taken away, according to that reasoning, but it's greatly contradictory that a battered woman who went to live in a shelter with her child, has her kid taken away with the excuse that she has no income or home. I mean the reason why she went there in the first place was because she needed help after escaping from her violent husband, who is now paying a 10 month sentence, if I recall correctly, for domestic violence. That's what they're implying now - if you've read more newspaper articles, I'm sure you must have noticed how the IMMF changes "their version" in every single statement! Thanks Kathy, please join the Facebook page and help spread the word if you can. We're organizing peaceful protests all over the world on June 15th, maybe you could help host one in your area. Cin, I know, I think all normal people feel the same pain upon hearing about Habiba :( Many people have offered to donate money, but an account hasn't been opened in Habiba's name yet. Fundación Raíces is taking care of her expenses for the moment, people are helping her find a job so that the IMMF can no longer use that as an excuse to keep Alma away from her. I think what would help most right now is to spread the word and e-mail as many Spanish embassies and reporters as you can. If you could go to/host a peaceful protest in your area, please do. Hugs! Chantal, it's not the whole of Spain that did this, but please go ahead and let the Spanish embassies and consulates in your area know how you feel about this. Thank you. Her strength is amazing... that's what all the people who are working directly with Habiba have said. Nadia, Dr. Olza and other people working close to Habiba have felt the need to redirect things and not focus only on their breastfeeding relationship. It's been about 11 days now, since they were separated, and although they're perfectly aware of the importance of nursing, the number one priority right now is to get them back together. The Spanish authorities have been constantly changing their statements in the press, contradicting themselves over and over, and making the whole case seem fuzzier by the day. Several Spanish reporters have made comments portraying those defending Habiba and Alma as breastfeeding fanatics (Grrrr), and Dr. Olza asked people *not* to organize nurse-ins as they would probably be feeding the trolls in this sense... Better just protest peacefully, some people are printing the posters I made, others are singing lullabies as a way of reminding authorities that this poor baby is sleeping without her mom yet another night. Thank you for your support. This is horrible, I sent this article to NPR as well in hopes that they would cover the story. It's a violation of woman's rights plain and simple. Things like this should not be allowed by any government related organization in any country. I will join in the outcry as much as I can to add one more voice. Hi. I know a lot of people are discussing this as a potential hoax and there has been a lot of pushback against that. I just wanted to let you know that, in an attempt to help, I asked the administrators of the habiba facebook page for more verifiable information. I handle press for a living and can get this in front of newspaper and television reporters, producers, and editors, but only if I have something better to go on than third-hand reporting. Even the quotes in El Pais are not substantive. I want to know why Dr. Ibone Olza does not provide a telephone number or go on the record officially. I am absolutely in the camp of having faith, especially when it could be this important, but something is not adding up here. i'm posting this here because I want to be wrong, and I hope the organizers will read this and strengthen their credibility and consider honing their approach. I handle media and press for a living. I'd like to help, but first there must be a place for the press to get verifiable information. You need a press kit including releases, information about your cause, information about the mother, child, and the organization who was sheltering her, and the IMMF. You need a list of individuals with contact information for the people who can discuss this story. Without that, it is impossible for newsmedia to discern this from a hoax. I've looked hard and have not seen any direct quotes from anyone involved with Habiba or Alma's care, or Habiba herself. Nor have I seen any of the statements or releases that quote the IMMF in the news. I only see third-hand reporting on it and a google doc that has been passed around. If you can send me some verifiable sources, I will get them to a list of contacts at the major news networks. No guarantees they'll run a story, but it's absurd to think they wouldn't. If a CPS-like agency in Madrid is denying a competent parent rights to her child based on racism, erroneous assumptions about childcare, or adoption profiteering, this is a story. Unfortunately, it is not a story without credible spokespeople with provable ties to the situation. i got a timeline for ibone, i asked her to put it in a official document, but she only posted it in the fb group :("
"____: there is a lot of material out there but it's in Spanish. if you know someone who reads Spanish, it might help you but if it needs to be translated officially, we shouldn't spend money on that, I personally think. in any event, the American press isn't going to get this baby back and at worst, the Spaniards will feel why is the American press lecturing us. Peronally I think we should concentrate our efforts on the Spanish press. They have already started to cover the story but we need them to get it to front page. There we don't have to convince anyone that is not a hoax. No offense, ____, I understand your point I just think it's not where we should put our resources." I hate to doubt this story, I really do. But how hard is it for the people advocating on behalf of Habiba to write a press release, with a formal statement from a verifiable individual connected to the case, including a name and title and telephone contact information. This is not hard, nor is it resource-intense. It seems to me that when I pushed them for verifiable information, they told me they did not need my help. If this is NOT a hoax, I don't mean to be unkind, but this is being stunningly mishandled. I'd absolutely hate to think that there is a real woman out there whose advocates aren't taking these simple steps to help her. June 16, 2011 | F.B. Hi FB, I wrote that article and have spoken to Ibone Olza and Claudia Pariente, who are directly related to Habiba's case. I've sent them the link to your comment and asked them to reply personally. This is not a hoax. Since Annie and I have published this article, Carlos González, a very well-known pediatrician and writer has also issued a public statement on Habiba's case. Isabel Fernández del Castillo, also a writer and birth activist, has met with Habiba and written her impressions on the FB group. 3 other well known doctors have written a public letter rebating what the IMMF has used as grounds to take Alma away from Habiba. Louma, thank you. I used my real address, please ask Annie to share it (I don't want to post this publicly) if you can get in touch with me and provide more info privately. I would genuinely like to help but they absolutely need to put out more verifiable info and take ownership. Hi. This is not a hoax.... Please contact me if you need more information. Personally I believe there should be an inquiry into this institution. It seems to me like someone's making money off drugs and formula, at the very least, and I strongly suspect Habiba isn't the first mother to go through this. I think further investigation is required, because there's serious abuse of power at work here, and the fact that they have STILL not reunited this family only strengthens my thoughts on this matter. And it's 18 days already. I feel sick every time I think of this family - which is at least every time my nursling calls my name. I think that the IMMF's initial stance of it "will make more difficult putting the child for adoption if this need arises" bares further thoughts. I would love to see an investigation into their adoption policies, and whether any forced adoptions might be discovered. I don't believe for a moment Habiba is the first woman they've done this to, and would she ever have found out where her child was taken if she hadn't gone for help? I am not sure which century are we living in... I expected people in this century to be educated and rational. Government. What could possibly go wrong? She leaves her abusive man who may take her life to go to the government who abuses her and takes her baby (like taking her life). This is a horrifying abuse of power. Habiba got her baby back!